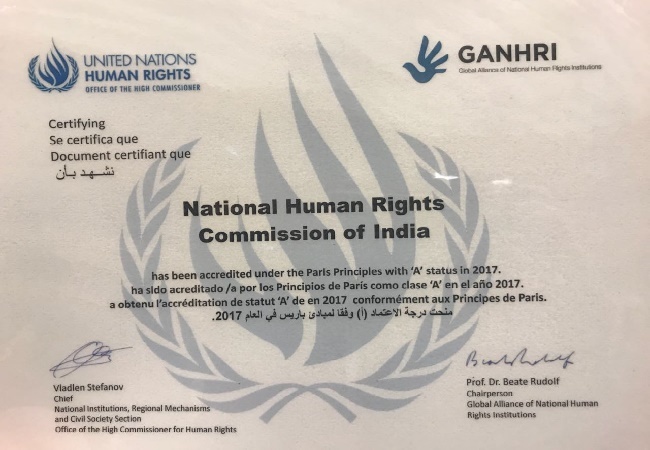 The National Human Rights Commission, India has retained its 'A' status of accreditation with the Global Alliance of National Human Rights Institutions, GANHRI for the fourth consecutive term of five years. It is given to those NHRIs, which, after a rigorous process of review every five years, are found fully compliant with the UN mandated Paris Principles. Mr. Justice H.L. 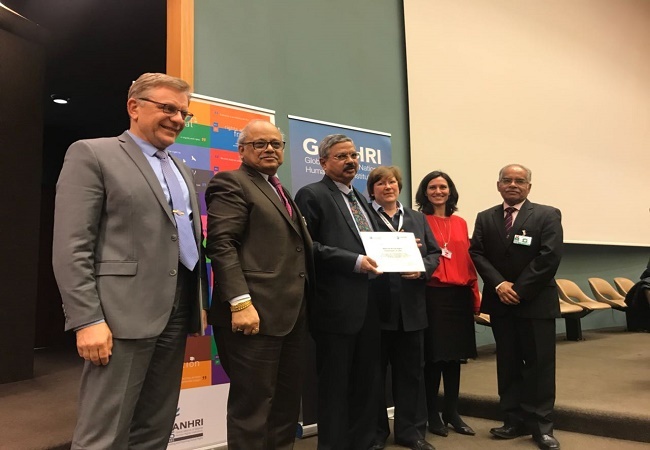 Dattu, Chairperson, NHRC was presented the certificate to this effect on the occasion of the ongoing annual meeting of GANHRI in Geneva, Switzerland from the 21st to 23rd February, 2018. NHRC Member, Mr. Justice P.C. Ghose and Secretary General, Mr. Ambuj Sharma were present on the occasion. The Accreditation confers international recognition and protection of the NHRI. 'A' status accreditation also grants participation in the work and decision-making of the GANHRI, as well as the work of the Human Rights Council and other UN mechanisms. The NHRC, India got 'A' status of accreditation first time in 1999 which it retained in 2006 and 2011 reviews. It was under the process of review for 2016, which was deferred to second session of 2017, when the Sub Committee on Accreditation of GANHRI recommended giving 'A' status again to the NHRC, India in November, 2017. The accreditation is given after a rigorous process of review of the NHRI by the GANHRI through its Sub Committee on Accreditation (SCA). The United Nations' Paris Principles provide the international benchmarks against which national human rights institutions (NHRIs) can be accredited. Adopted in 1993 by the United Nations General Assembly, the Paris Principles require NHRIs to protect human rights, including by receiving, investigating and resolving complaints, mediating conflicts and monitoring activities; and promote human rights, through education, outreach, the media, publications, training and capacity building, as well as advising and assisting the Government. The Paris Principles set out six main criteria that NHRIs require to meet. These are: Mandate and competence, Autonomy from Government, Independence guaranteed by a Statute or Constitution, Pluralism, Adequate resources; and adequate powers of investigation. The GANHRI found the NHRC, India perfect on all these counts to be given 'A' status of accreditation with it. The Office of the High Commissioner for Human Rights (OHCHR) is a permanent observer on the Sub Committee on Accreditation, SCA and serves as the secretariat to the GANHRI and its SCA. The GANHRI accreditation system has evolved and been strengthened over the past years. Measures that the GANHRI adopted to improve the process include: a system by which NHRIs are reviewed on a periodic basis of 5 years; an appeal process for NHRIs to ensure greater transparency and due process; a more rigorous review of each application; more focused recommendations; and wider distribution and greater knowledge of SCA recommendations by NHRIs and other stakeholders, so that they can follow up in-country and contribute to the accreditation process.